NEW YORK, March 5, 2018 – The Greater New York Chapter of The Links, Incorporated (GNY) recently hosted an afternoon of learning and engagement as part of a national initiative to advance and promote STEM Education among minority youth. 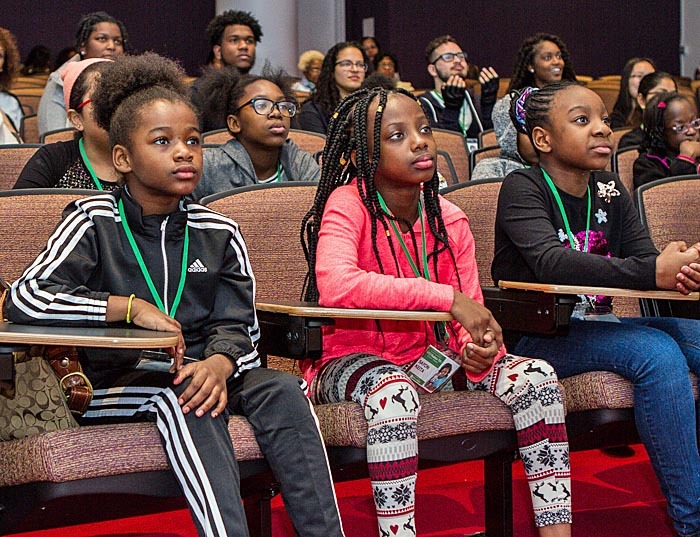 Presented by the GNY Links International Trends and National Trends Facets, STEM-ulate NY: Future Thinkers was aptly held at New York University’s Tandon School of Engineering at Brooklyn’s Metro Tech Center. Nearly 20 students were in attendance, each receiving the benefit of one-on-one exchange and cross-disciplinary insights from NYU School of Engineering students, who volunteered their time to work with the elementary school students on various aspects of the STEM curriculum. Among the participating students were 14 children from Harlem’s Promise Academy II charter school. The full day of activities began with the screening of an original video, "What is Engineering" by Heir-O-Links Kyla Jones and Kendal Askins, with instruction by Ms. Askins about the construction, functions, and differences between serial and parallel circuits. The instruction was followed by the students having hands-on opportunities to build circuits, design and create artwork, problem-solve, and build the optimal circuits to light the artwork. Each girl received a copy of the book, “What Color Is My World? : The Lost History of African-American Inventors", courtesy of Link Anita Farrington. “Presenting this event is in full alignment with the United Nations General Assembly resolution challenging all of us to ensure that women and girls of all ages have full and equal access and the right to participate in science, technology and innovation as a means of achieving gender equality and empowerment,” says Rev. Sydney Avent, J.D. “GNY Links presented this event as a means of expressing our support of the UN’s International Day to recognize the critical role women and girls should and do play in science and technology. We are therefore delighted to partner with NYU Tandon School of Engineering in making this possible,” Rev. Avent adds. GNY Links who participated in the event include: Sydney Avent, Nailah Flake-Brown, Lesley Horton Campbell, Michelle Donaldson, Anita Farrington, DeNora Getachew, Sheryl Huggins, Kim Hylton, Debbie Jackson, Ruth “Cookie” Jean, Donna Jones, Jillian Joseph, Yvonne McLeod, Gerri Warren Merrick, Ketly Michel, Gail Monroe-Perry, Helen Shelton, and Minta Spain. Heir-O-Links Kendal Askins, Kianna Jones, Kyla Jones and Michael Kurtz also participated. The goal for GNY Links is to expand STEM-ulate NY: Future Thinkers into an ongoing program that would be incorporated into an umbrella effort to bring other like-minded partners together in this important. Greater New York Chapter, founded in 1949, was the first chapter chartered in New York and comprises members from all five boroughs in New York City and from Long Island. Under the leadership of President, Rhonda Joy McLean, Greater New York Chapter is committed to fostering community outreach in the New York metropolitan area through quality programs with a long-term impact on the well-being and enrichment of African-Americans and other traditionally underserved communities. For the past several years, Greater New York has focused heavily on enhancing the lives of those who have been victimized by domestic and family violence through each of its five Facets: Services to Youth, The Arts, Health and Human Services, National Trends and Services and International Trends and Services. For more information log on to Greater New York Chapter’s Web site at www.greaternewyorklinks.org.